Fans of Fantasy and the series of Tolkien books will know what a Nazgul is. 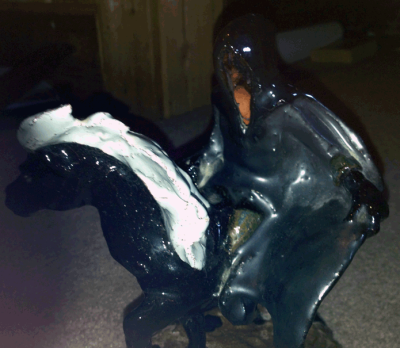 A black rider, hooded and cloaked, riding upon a fiery eyed black horse. 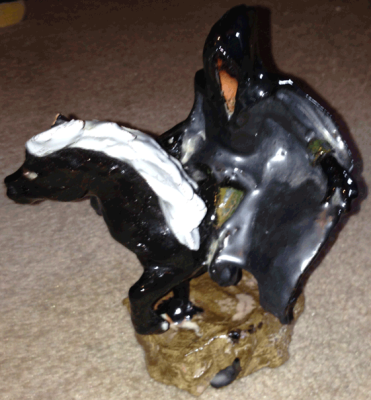 This red clay statue is glazed using several kinds of glaze - matte black for the inside of the rider's cloak, glossy black for the outside of the cloak and the horse. 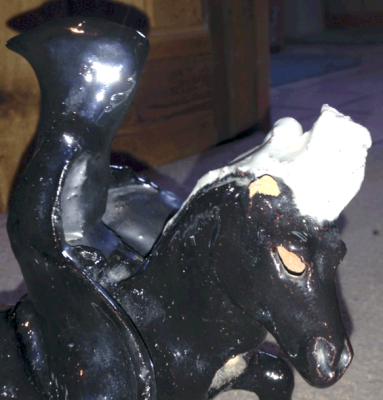 The horse has a flowing white mane and tail - the rough, pebbly red clay peeks through the glaze in several places. The base is glazed in earthtones, and has drips of black and white glaze on it. 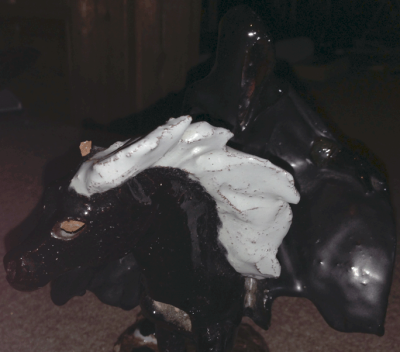 There is an opening in the back of the rider and on the chest of the horse for a cone of incense to be placed. The smoke rises up and comes out the hood of the rider and the eyes of the horse. 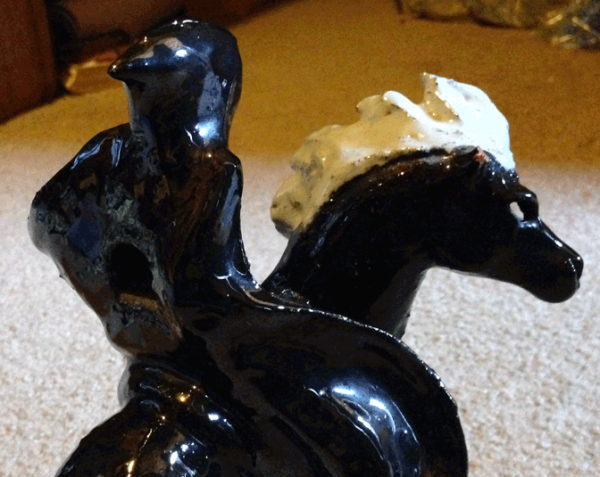 One ear on the horse is schipped, displaying the pebbly red clay the piece was created with. The pictures don't do it justice. 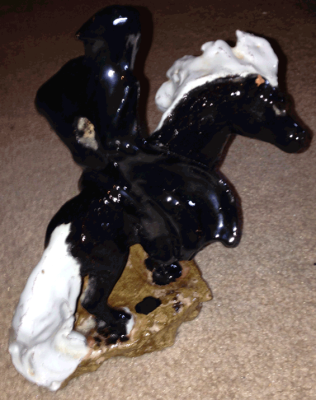 This piece was purchased at the Texas Renaissance Fesitval and has a signature on the side: Sandy Kahn, April 1983. That would make it 32 years old. 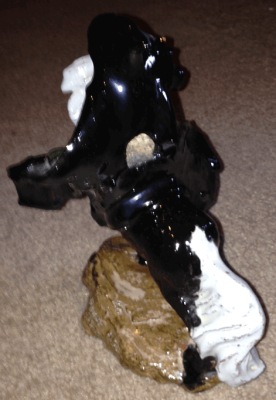 This piece stands approximately 8 inches tall, 6.5 inches long and 5.5 inches wide. It weighs 2 pounds, 3.8 ounces. 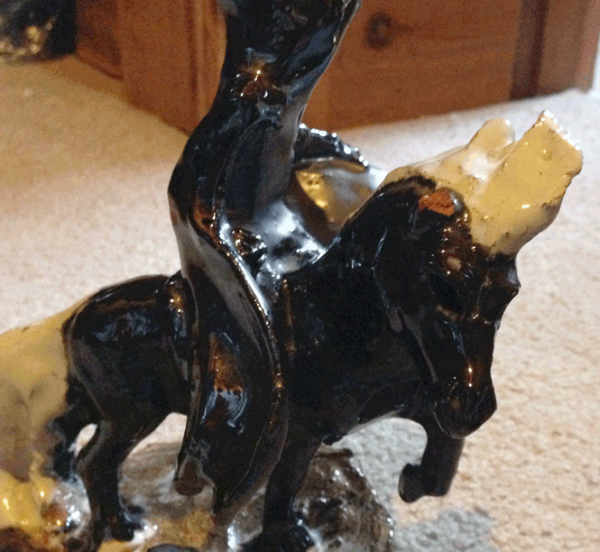 This piece is hand made from white clay which was fired and painted with acrylic paints. 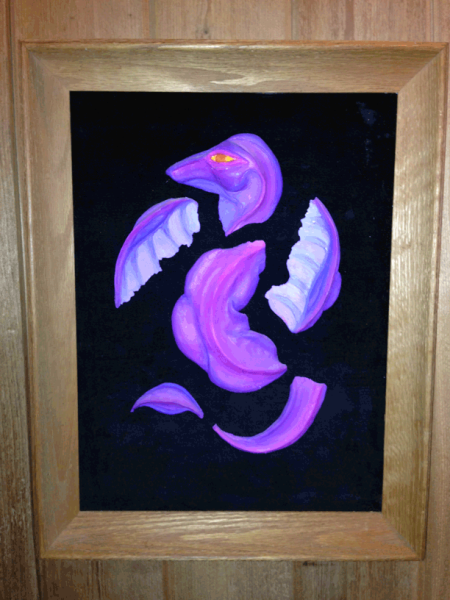 The pieces were then mounted on black velvet and framed as seen in the pictures. There is some staining or dripped glue on the velvet in the upper right corner that can be seen in the photographs. It is meant to emulate the style of black velvet paintings, and was purposely painted with bright colors. It does NOT glow in the dark. 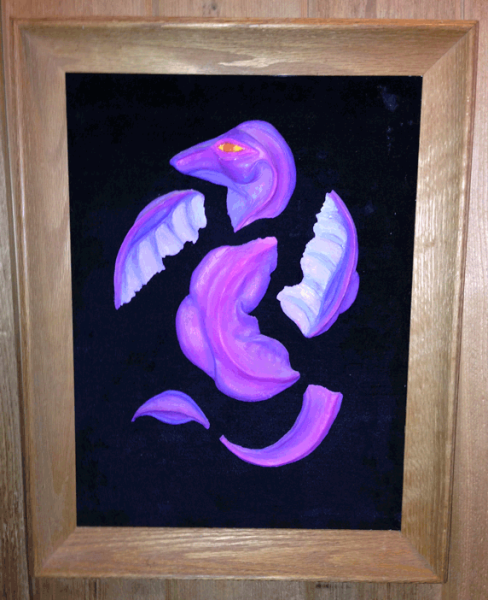 This piece is about 30 years old and although it's not signed, the artist is me - Victoria Ratcliffe. I can sign the back of it if you'd like, but it's meant to be signed when it's completed.